Created by ANDREA IZZOTTI from Genova, ITALY. On line since 5 FEBRUARY 1996! 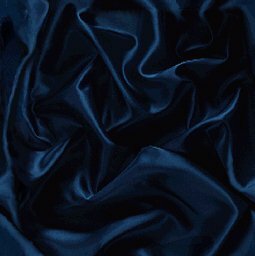 this page has been accessed 190.000 times. With the close of the 60' and the serious message oriented music of the era, the "we" generation became the "me" generation. Music was getting to be fun again, and it was time to party. KC and the Sunshine Band were primarily interested un making people happy with their party music; they were actually at the forefront of a revolution during the mid and late 70's that pushed rock towards its current percussive and dance oriented direction. The sheer sonic assault of their great hits like "Get Down Tonight" and "That's The Way (I Like It)" was unprecented and all more remarkable because the songs were largely the work of novices in the recording studio - keyboard player and singer H.W. "KC" Casey and bass guitarist Richard Finch. Casey worked in a retail record store in Hialeah, Florida, and hung out at a nearby recording studio, volunteering to do odd jobs for free just to be close to the action. He'd been working there for a year when Finch, an audio technician, was hired (for $46 per week). Casey and Finch spent their evenings and weekends at the studio writing and rehearsing material. It was during this period (mid '74) that they wrote and produced "Rock Your Baby" for TK artist George McCrae. The song took off immediately and hit Billboard's top spot in August of '74. One of the essential singles of the '70s, Mc Crae's wildly soaring vocal and Casey & Finch's sparkling production were indicative of things to come. Startled by the skill shown in "Rock Your Baby" TK Records gave the go ahead for the formation of KC & The Sunshine Band. Its original members included Jerome Smith, guitar; Robert Johnson, drums; and Fermin Goytisolo, congas.The group's first two singles, "Sound Your Funky Horn" and "Queen of Clubs" were hits in England but failed to chart in America. Both feature an engagingly loose party atmosphere and display a band searching for a unique sound - and quite attaining it, but well on their way. In the late summer of '75, they found it with "Get Down Tonight". A scorching , remarkable track, its cataclysmic production blew everything else off the radio. Recalling the evening he laid down the vocal track for "Get Down Tonight", Casey said, "I couldn't believe it, it was such an incredible sound. I remember they must've played it back a hundred times and I just couldn't believe it". What gives the track its distinctive sound (aside from its thunderous rhythm section) is the electronically speeded-up guitar throughout, making it sound like no record before or since. With its simple lyrics, its bright, crisp, and trebly production, plus the unique vocal stylings of H.W. Casey (which many say has been emulated by Fine Young Cannibals, Roland Gift on the 1989 #1 hit "She Drives Me crazy"), "Get Down Tonight" defined the band's sound. There were many more great records to come. As a follow-up, the band returned with "That's The Way (I Like It)", the lyrics of which are nothing less than the sexual communication of two partners engaged in copulation. Casey's "un-huh" alternates with the "un-huh" of the female background singers for a positively pornographic effect. According to Casey, the version of "That's The Way (I Like It)" which went #1 in November '75 was much tamer than the first rendition: "I had to cool it down. The "un-huhs" were more like a groaning and moaning and I had to clean that up considerably. It was 1975 and I just thought it was a little too risque". As confirmation of his instinct, 14 year later a far more overtly sexual version of "That's The Way (I Like It)" - called simply "I Like It" by Dino - entered the top ten. Casey & Finch returned the following summer with the record most often associated with them, "Shake Your Booty", Its actual title is "(Shake, Shake, Shake) Shake Your Booty" and according to Billboard it stands alone as the song with the most repeated words in its title ever to make it to #1. 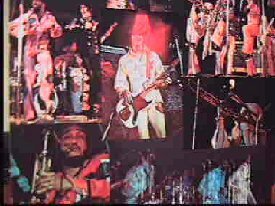 Trivia aside, "Shake Your Booty" is most noteworthy for its wonderful slinky and seductive intro, its brilliant horn charts, and perhaps most of all for the polarizing effect it had on the rock audience in the mid '70s. Speaking to Billboard at the time, Casey found himself apologizing for "Shake Your Booty"; to some it was a nonsense song, but it had a lot more meaning and depth...there were several connotations to "Shake Your Booty". It could mean to get off your can and get out there and do it in every area, not necessarily dancing , but in you whole life. 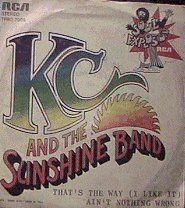 Kc & The Sunshine Band were now a phenomenon. They followed "Shake Your Booty" with an album track, "I Like to Do It", which broke their steak, barely cracking the Top 40. Undeterred, they returned to form following spring with "I'm Your Boogie Man". One of the cooler items in their catalogue, "Boogie Man" features an ominous, hushed intro and barely audible off-mike count of "one-two-three" which kicks off this blistering ode to the sexual ability of the song's protagonist. They followed "Boogie Man" with one of their very best - "Keep It Comin' Love". This shows KC & Co., at the top of their game. The song's irresistible guitar sound was later employed by producer Nile Rodgers for Chic and David Bowie, among others. Prince paid homage to it in 1988's "Alphabet City". During this time, Saturday Night Fever was released and its massively successful soundtrack album featured the B-side of "Shake Your Booty", "Boogie Shoes". Not until mid '79 did KC & The Sunshine Band release the ballad "Please Don't Go", commercially successful attempt to alter their trademark sound. It became the group's fifth and final #1 record. During their two year hiatus from the charts, the group tried on a number of styles, the most interesting of which - straightforward rock n' roll - is "Let's Go Rock and Roll". Not a hit, it nonetheless holds its own with the group's more legendary triumphs. TK Records went bankrupt soon thereafter, and the band was signed by Epic. Two albums were released, no hits resulted from the 1 st Lp, then on the second Lp a track called "Give It Up", became a Number 1 hit in England. Despite this Epic refused to issue it in the United States. A frustrated KC was forced to begin his own label, Mecca, and he released it himself. Give It Up was a terrific forum for KC and became a big hit in America. Looking back from today's perspective it's amusing that KC & The Sunshine Band - often labeled as non-progressive, was actually the most progressive rock band of the 70's. They had no precedents, were completely original in their approach and virtually by themselves, pointed the direction that pop music would take in the 80's, with 9 Grammy nominations and the receipt of 3 Grammy awards. KC & The Sunshine Band enter the 90's with a new release "The Game of Love", and a U.S. tour to continue their legacy. My Seventies Page for links to other related pages and Bands!